Though we saw leaked images of the 2011 Ford Fiesta yesterday, today we've got complete details on Ford's second Europe-to-US entry. 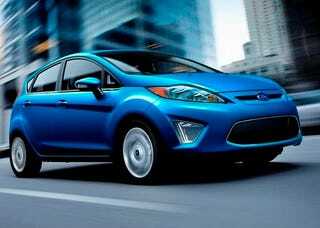 The Fiesta hits our shores as either hatchback or sedan with a new dry-clutch automatic transmission and 40MPG highway. When Ford of Europe originally designed the Fiesta for the rest-of-the-world market, there was no intent to sell the little bugger in the United States. There was no great demand for compact fuel efficient B-segment hatchbacks. Cue the Carpocalypse and that decision was slowly quickly reversed. Since the car would need to be Federalized for the US market, it went through some significant rework. The US-spec Fiesta only shares about 60% of its parts with the Euro model, but looking at it from the surface you'd be hard pressed to tell. The most glaring exterior difference between the two hatchback models is in the nose. The US Fiesta has a considerably beefier front crash bar hiding under that bumper cover so the nose is ever so slightly longer to make room. It also gets in the way of the space formerly reserved for fog lamps, so instead they've been replaced by "driving lights" which are rather slick looking LED lightpipes borrowed from the Verve concept car. Aside from a few tweaks here and there, like integration of the backup lights into the tail lamps and light pattern redesign, and revised grille, that's the story on styling for the hatchback. Then there's the sedan. We were nervous about the sedan to be honest. There was tremendous potential for monstrous ugliness, but Ford managed to tack on a trunk pretty well. From the rump the Fiesta sedan reminds us of the European Mondeo, but there's a lot of awkwardness in the sheetmetal above the rear wheels. The Sedan is designed as the more grown-up of the two versions and that intent can be seen in the detailing. As to the motivational equipment for the Fiesta, the car comes with a 1.6-liter double overhead cam inline-four fitted with electronic power assist steering and turning out 119 HP and 109 lb-ft of torque. Mated to the one engine is your choice of either a five-speed manual transmission or a six-speed automatic. Thanks to the brand spankin' new "Powershift" automatic transmission, it doesn't even have an impact on fuel economy. The Ford/Getrag effort is essentially two manual transmissions mashed together and actuated with a pair of servos. It operates with a pair of dry clutches swapping between gears dedicated to each. While the Fiesta won't be outfitted with any kind of manual control on the automatic, the transmission is capable of it and with a maximum torque capacity of 184 lb-ft in its current guise, we're thinking it'll be used elsewhere with more sporting intentions (Fiesta ST, Ford, come on, you know you want to). Compare to the four speed auto it replaces and it's responsible for a 10% improvement in fuel economy alone. Fiesta fuel economy is set to be pretty impressive at 30 MPG city and 40 MPG highway. The front suspension is a Macphereson stut and the rear uses a twist beam axle, and since the car is fitted with all-season tires rather than the de-rigeur seasonal summer tires in Europe, the car's been retuned to retain its zippy nature. Inside, the Fiesta has undergone revisions over its European buddy, some good, some bad. In order to address the unbelted occupant restraint requiremets for the US, the dash and center console were revised to provide more space behind for impact absorbsion, protecting morons without seat belts on. Safety requirements dictated a lot of the shape changes but also led to a plethora of standard airbags. The Fiesta comes with dual front, thorax and hip, side curtain and knee bolster airbags, more or less a cloud of airbags in a crash and by far the most in this class. The shapes and controls, gauges, and screens are virtually identical to the Euro model, but some paint has been removed and the seats wear different, less pleasant looking fabric. The US model has the option for some really nice leather seats with contrasting piping we're wondering if they swiped from the Lincoln parts bin. Amusingly, a third cup holder has been added in between the two already in the center console and it's sized perfectly to fit a Red Bull style can. We tried it, it works. In all, the US-spec Fiesta looks like it retains pretty much everything making it such a lovable car in Europe. Considering the amount of rework that had to go into the car, that's no small feat. Now we just need to see how it drives.